LBPD Lt. Jim Foster holds up a graduation invitation he received from Long Beach resident Tiffany Hall. Photo by Stephanie Rivera. It had been nearly a decade since police Lt. Jim Foster had seen Tiffany Hall, who was suffering from substance abuse throughout their many encounters in the streets of Long Beach, but on Wednesday morning the two were able to cross paths once again—this time under much happier circumstances. 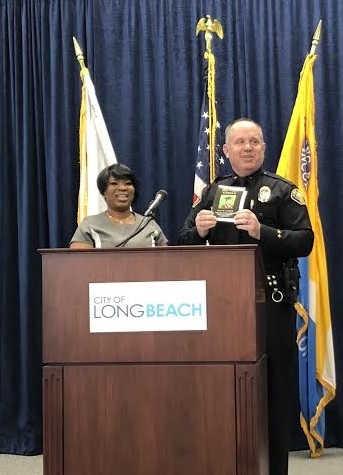 “I’m here because I want to thank Lt. Foster for his respect and his compassion and the empathy that he showed to me and anyone he came in contact with,” Hall, a Long Beach resident, said during a press conference at the Long Beach Police Department (LBPD) headquarters downtown. Hall said each time she encountered the officer of over 17 years he would always encourage her to turn her life around, telling her she could do better, to try to go to school, to stop what she was doing. Now Hall is scheduled to graduate with a bachelor’s degree from Cal State Dominguez Hills next month—and surprised Foster with an invitation to attend. “I wouldn’t miss it for the world,” Foster said. The third generation Long Beach policeman said he remembered Hall as full of sass and energy and with a larger-than-life personality. Being a seasoned officer and having experienced many interactions with people in similar positions, Foster also knew she had potential. Now Hall, who once was a product of her drug infested environment, plans to go to grad school and become a social worker to help others the way she was helped. Foster said the stories his father told at the dinner table helped guide him as an officer, including to be tough on crime but kind to people—which could be seen in one particular encounter with Hall that she remembered. Hall said one of her run-ins with Foster was on her birthday and after going around the corner passing her the first time he appeared before her once again. While Hall said she could never understand then why Foster kept taking her to jail, she said she understands now. Hall said now she tells herself to never look back and to keep moving forward. “If you keep looking behind you, you’ll never be able to see what’s in front of you,” she said. Hall and Foster’s reunion was made possible through the city’s justice lab, launched in January to provide new tools to first responders to divert residents in need out of the criminal justice system and toward much needed resources, said Tracy Colunga, director of the city’s Innovation Team which partnered with other city departments and community groups to develop the lab. Colunga said after analyzing over 100,000 offenses in the city during a five-year time period, the i-team determined that 85 percent of repeat offenses aren’t serious crimes but rather misdemeanors. The team also conducted 26 in-depth interviews with individuals who had been booked or cited 11 or more times. Colunga said the justice lab is helping first responders like police officers, firefighters and homeless outreach teams receive new tools to break the cycle of incarceration.